High chairs are one more THING that I believe you just don’t need. For starters, if your family eats their meals sitting on the floor, as some cultures do, then your baby certainly doesn’t need a high chair. Why don’t the Thais, who adore children, use highchairs…? Because the tradition of Thais from ancient times is to gather in a room with bamboo mats on the floor, set the food and plates out on the floor and sit around and share a communal meal with everyone eating with their hands. Baby is being held and fed. With a circle of relatives (not just mum and dad) and neighbors eating together, the baby is fed and passed around like a ball in slow motion rugby scrum. He needs no restraining straps. No airbags. No over anxious parents worrying that he will fall from a height and land on his head. He passes from hand to hand with ease. Often foreigners will ask how is it that Thais are so attached to their family. They didn’t get that way growing up in a highchair is one answer. Another answer is that people who were raised dining on the floor with a group of people were also likely to have slept in a room with the family. In the West, a baby has his or her own room. They separated—at two powerful social points of contact—when they eat and sleep. An interesting point of view. One that reminds me of the attachment parenting philosophy. But what can you do with your baby if your family eats their meals sitting at the table, not on the floor? How did families in the West feed their children before high chairs became popular? What do families who can’t afford or who don’t have space for a high chair do? What about other cultures where high chairs, along with nappies and cots, are a Western luxury not considered an essential item for raising a child? What do they do? I don’t have the answers to the above questions, but I can tell you what we did. We never bought a high chair for our son Ben. Mainly because we live in a small apartment and there’s very little space for a high chair. A handful of times he sat in our home-made booster seat, but, from about six months of age, he sat on our laps at every mealtime. He sat on our laps and ate from our plates. Although feeding our baby this way seemed completely natural to me, I don’t personally know many families who have done this. I’ve found a few references to feeding a baby without a high chair on forums on the web and I recently found the article below describing “Highchair-free eating“. The author then suggests to move the baby to a small table and chair where they can eat independently. But I’m not keen on that idea as the child then doesn’t eat with the rest of the family. By sitting your baby on your lap they see how you and other members of the family eat and behave at the table. You are their role model in everything including this. At mealtimes I sat at the table with Ben sitting on my left leg, my left arm around his back, and left hand on the table. This meant I could only eat with my free hand, my right hand. But if I needed to move my left arm away to use both hands, I made sure he wouldn’t fall by clamping one of his legs between my thighs. We always had something on our plates that Ben could eat with fingers or a spoon. Mashed vegetables, scrambled eggs, pasta, beans, mince, rice, peas and corn are some examples. (Read up on “Baby Led Weaning” if the idea of starting your baby on whole foods instead of puree is new to you.) Sometimes we put things he could eat on the table itself, sometimes on a small side plate. We did this for about 10 months. Eating out in a restaurant or with family was never a problem because he was used to sitting on our laps. And it’s even less of a problem now. When Ben was about 16 months he moved from our laps to a regular dining chair. At that age he was tall enough to climb up and down from the chair by himself, and on his knees he is the right height to eat comfortably at the table. In my opinion, high chairs cause more problems than they solve. Let baby enjoy the lap of luxury. If your child refuses to get in or stay in his high-chair, let him sit on your lap and eat off your plate. If baby begins messing with your food, place a few morsels of food on the table between baby and plate to direct his attention away from your dinner. Sitting on our laps, Ben was quite content during meals. The exception would be if he was tired. Mealtimes were then rushed and over in 5 or 10 minutes. High chairs can also be a dangerous fall hazard. 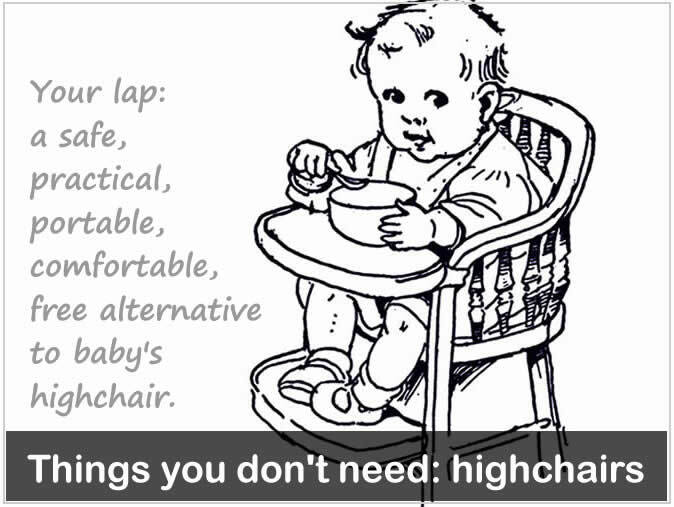 A high chair is much higher than a regular chair, and it’s a long way for a baby to fall. In late 2013 a study came out in the US that found about 9,400 high chair-related injuries were treated annually in U.S. emergency rooms. Falling out of the chair accounted for almost 93 percent of the injuries. Our son never fell while sitting on our laps. Looking back, I’m glad we didn’t use a high chair. 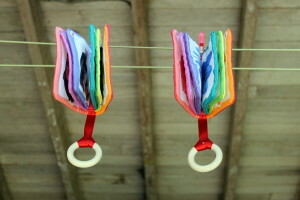 I don’t think that they are an essential item for raising a baby. Useful and convenient? Maybe. But essential? No. So if you’re looking for a practical alternative to a high chair, one that’s safe, portable, comfortable, free… Well, you have one already: Your lap. If you never used a high chair to feed your baby I’d love to hear from you. Why did you not use a high chair? What did you do instead? What problems did/didn’t you have as a result? Also, if you know of any resources/articles on the internet that talk about this topic I’d be grateful if you could post a link in the comment section below. I have a 1 year old and I never got a high chair because then I’d be cleaning mush from carpet everyday. Some people say it’s child abuse-can you believe it?- to have your child eat his snacks on the floor. Now I’m not talking about just any floor, I’m talking about the living room floor that has carpet that is vacuumed every single day! For his meals l sit him on my lap or he stands next to me while I sit on the chair to feed him. So far my only problem is outside people, because they’ve never heard of feeding babies without a high chair. They think it’s atrocious and like I said child abuse to let the baby roam while he eats his snacks, and these very same people have never seen me feed him from the lap because he’s a quick eater. I tried out a high chair and it took an hour for him to finish his meal. On my lap? Not even 10 minutes. So that’s a huge plus. Anyway, my experience is great so far and I much prefer him on my lap than on a highchair that I’m going to have to clean every single day. That’s so good to hear! Thank you for sharing your experience. I was thinking of this today as our toddler still occasionally eats while sitting on my lap. I was looking at the food smeared on my arm and I thought to myself how much quicker and easier it is to clean my arm than to clean a high chair if we had one. As for eating on the floor – that’s called a picnic! We do that quite regularly too.